Four teenagers were arrested over the weekend for a spree of robberies and baseball bat attacks against Amish of Geauga County, Ohio. 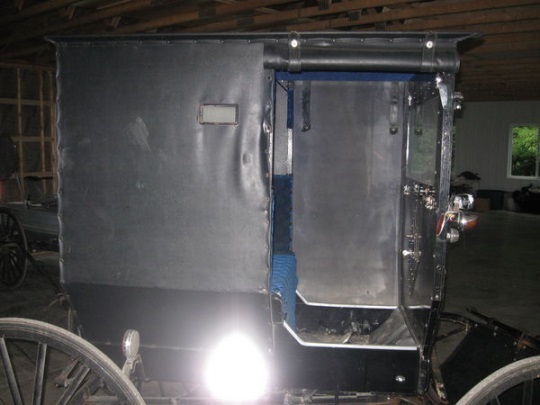 The youth targeted Amish businesses and Amish in buggies and “brutally beat” several Amish men, in incidents over the past week and perhaps earlier. The first reported attack occurred June 22 or 23, with numerous reports of break-ins over the following days. 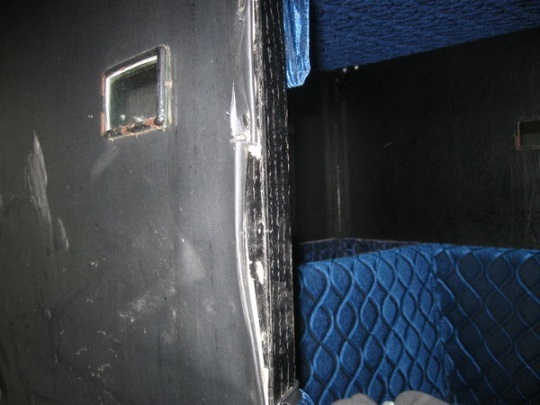 In one of the first assaults, the attackers damaged a buggy (see photos) and caused minor injuries to their victims. The assailants were described as “homeless and hungry”, and one expressed relief at being apprehended. The suspects admitted to the church burglary and one suspect said he was relieved they were caught because they would now have a place to stay and food to eat, he said. He added that many places may not have reported a break-in, and break-ins occurred in Geauga, Ashtabula and Trumbull counties since May. Three of the suspects are from Middlefield (a town in the heart of the Amish settlement) and one from Cleveland. “I think they were under the belief that the Amish would not report the crime,” said a police official. A total of eight break-ins have been reported. Victims should contact the Geauga County Sherriff’s Office at 440-279-2009; 440- 564-7131; or 440-834-1858, ext. 2009. The Amish somehow will have to get a cell phone. I mean their custom is ridiculous, how are the suppose to get hold of the Law Enforcement? If the Amish had a Restaurant. they, must by Law have to up-date to the health of department 2014. I must say, yeah, on Sunday Morning when good people are in Church, to get a robbery. I must say, 1st, September 11th. we did not know what would happen next. Then, an Amish School got harsh attacks. Thanks to the News-media. This kind of Behavior against the Amish will be repeated. and the next time an attack happen, their may not be good people around to summons the police. I rather not go on, as I made my point. No, you really didn’t make a point at all. I feel dumb for even reading this!!! I am a Englisher. I have a cell phone and I don’t think to take it with me all the time. The Amish must have been able to contact the police as the police solved the crime. I feel it is terrible if anyone gets robbed like that, especially the Amish. Unfortunately, I think robbers feel they Amish are easier to rob than the Englishers. The men that did it are so young. It also shows that the Amish will call the police when necessary. Maybe if more of these stories are publicized, the idea that Amish do not contact police will start to disappear. Though some Amish will be more comfortable dealing with police than others. And Anonymous, how do you know that these Amish did not call the police using a cell phone? Quite a few Amish young people and adults have them. Here is that great story from WEWS TV5 in Cleveland about the Kidron Amish store that used some technology and “smarts” to catch the thieves. This is such a sad thing to happen to the Amish or anyone. I do wish that they would report these kinds of things when they happen to them. Glad they were caught and the get a very stiff punishment.. When these crimes happen to the Amish the way our cultures are different is what so often comes to the forefront first. Next is the senselessness of violence and crimes against the Amish, it never makes any sense. Who would target the Amish and why? Well actually that answer isn’t that hard; it’s someone looking for an easy target, someone who takes advantage of what they perceive as weakness in the Amish. Perhaps the criminal is a person of a character as to almost have no character or who may have a mental illness, or some other problem. The young gang who victimized the Amish don’t seem the exception. They are four lads who appear homeless, jobless, without family and reckless. They are so different from the Amish whose lives are lived with purpose which is evident in almost everything they do. By chance or grace no one during this crime spree was fatally injured or killed, of some consolation I suppose, but not enough as I see it. All the injury and fear they caused the community shouldn’t go unpunished and some kind of restitution is in order. But then the Amish, no strangers to forgiveness have likely moved on already, forgiven, given it up to God, as is their custom and all while barely missing a beat, while following the simpler and peaceful rhythms of their lives. Maybe one day I could learn to be more forgiving, or perhaps their tormentors, after having received such grace, may become inspired to be better men. I like how you ended your comment, Gary. It would be a blessing if this could be a “turning point” for those boys. I can only imagine how miserable their lives must be. Mark and Gary, thanks – “miserable” is the word I was searching for. What they did was wrong but it also makes one wonder about their back story. Homelessness is classed a big city problem, we don’t expect to see it in small towns like Middlefield (pop. 2,694). No doubt there are bad domestic situations in the picture. I would guess that more Amish would feel sorry for these guys than angry, even the direct victims once they have time to get over the shock and harm done. It was also interesting to see the way this story was reported. In one of the stories I linked, three of them (the 18 and 19-year-olds) were described as “men” and one (the 17-year-old) as a “boy”. I know the legal cutoff for adulthood is 18 but it seems rather artificial to divide them like that, especially since boyhood lasts a lot longer than it once did. I know these Amish, I drove for them ! A great bunch of guys who would do anything for me !!!!! I am glad the police were able to catch the bad guys !!! As for phones/ cell phones in the Mespo area almost every Amish teen/twenty-something has a cell phone . Sharyn this reminded me that the Geauga community has had a bad run lately with violent events. Last summer two Amish teens were shot in a strange incident on an English property in the area. I hadn’t heard what happened with the men who were arrested for the shooting. From what I know Amish communities will have different responses to these sorts of things. In my son’s community, it might not be reported, but other “English” friends will report it if they find out. I love it when the surrounding community cares for its own this way. BTW, they do not have cell phones, though we have tried to give them one (rechargeable by hand cranking). One of the suspects expressed relief upon being caught. I share that relief. 1. The Amish businesses robbed at night netted the robbers only small change, or small amounts of cash. Likely not even minimum-wage money when divided by the four. 2. The Amish do report crimes to police. 3. Some Amish do carry cell phones. 4. The thieves were CAUGHT. Thanks for summing those up Ed. Good guidelines for anyone researching whether they should or should not try to rob the Amish. There is another story about armed robberies of buggies in Michigan (Gladwin and Clare Counties). We mentioned that story here a couple of weeks ago, though details were sketchy at the time. There is now a reward out and more details. Based on what usually seems to happen when criminals try to take advantage of the Amish, these people will probably be caught too. Amish forgiveness goes a long way, as evidenced by Anne’s story of the Amish forgiving the boys who burned down a barn, thus killing the cows within it. I can’t think of a better “punishment” (if you could call it that—it’s more of an opportunity to be a turning point, as Gary mentioned)—having the boys work for/with the Amish whose property and livestock they destroyed. I hope those who broke into the Amish businesses have that opportunity. My father (a Mennonite) was until recently an Englisher employee of a large and very successful Amish construction company in Ohio. I always thought it deeply ironic and typically hypocritical that not only was he the personal chauffer of one of the 2 principle partners; he also was the guy whose name appeared on the company cellphone bill. Yes, the Amish have cellphones. As for Rachelle and Garrett’s comments I can only say…”LOL and Bravo”. As for drivers & cell-phones, I once heard an Amish man compare drivers to airplane use, saying that though a person might fly frequently on business, they still wouldn’t consider buying and flying a plane themselves. It’s kind of funny, but maybe not as realistic. We have a non-Amish coworker who does a lot of our business related errands, but that is what the understanding was and we all benefit. I know a few Amish families who live on Bundysburg Road.. Hope it wasnt any of them or their families..
Its too bad that people are haters of those different from themselves.. but I know there are a lot of them out there in Middlefield.. I’ve heard them complain about the Amish repeatedly.. I dont think violence only happens in certain areas.. I think its everywhere & we as the public dont always hear about it. This holds true for the Amish in getting English medical treatment versus their own unofficial doctoring for their families. Their faith in God also leads them not to be non violent and to not go to war. Some English would say THEY are the reason the Amish have are safe, (taking God out of the equation) but the Amish would disagree. God helps them that help themselves…..
A man named Jack was walking along a steep cliff one day, when he accidentally got too close to the edge and fell. On the way down he grabbed a branch, which temporarily stopped his fall. He looked down and to his horror saw that the canyon fell straight down for more than a thousand feet. He couldn’t hang onto the branch forever, and there was no way for him to climb up the steep wall of the cliff. So Jack began yelling for help, hoping that someone passing by would hear him and lower a rope or something. “Yes, but who are you, and where are you? I like that joke Tom. I also like your description, “lower threshold for turning things over to God”. I had never thought of it in those terms. If they needed a place to stay and food to eat, wouldn’t it have been a lot easier to just knock on the doors of those amish folks and politely ask for it? Instead of beating them and breaking in and robbing their businesses in order to be thrown in jail? I’m sure they’d be able to work something out for them? The first punishment has been handed out, for the 19-year-old who drove the car in these attacks and robberies. A teen who drove the car used to commit organized attacks on the Amish was sentenced Oct. 27 to 8 1/2 years in prison in Geauga County Common Pleas Court. Chase Kontur, 19, whose last known address was in Middlefield Township, previously admitted helping attack the Amish for money because he thought they were easy targets and would not report the crime. I just cant imagine that people, even young people can be so incredibly ignorant.. Its so very sad. I guess they’re learning the hard way. Do you believe in natural remedies?